James Harden matched his career high with 61 points, delivering early and late to bail out the host Houston Rockets in their 111-105 win over the San Antonio Spurs on Friday. Harden, who also scored 61 points on Jan. 23 at Madison Square Garden against the New York Knicks , finished 19 of 34 from the floor while drilling 9 of 13 from 3-point range. 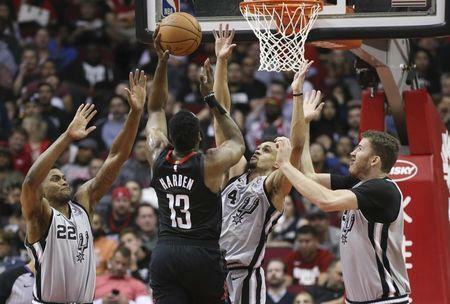 After the Rockets coughed up a 19-point, third-quarter lead and fell into a 100-94 hole late in the fourth, Harden responded with three successive 3-pointers and a pair of drives to the basket to secure the victory, the Rockets' third consecutive win over the Spurs. Bryn Forbes led five Spurs in double figures with 20 points while Derrick White added 18 with eight rebounds. DeMar DeRozan posted 16 points, eight rebounds and eight assists while LaMarcus Aldridge paired 10 points with five blocks for San Antonio, which captured its first lead at 85-84 on a Patty Mills reverse layup with 10:48 to play. Joe Harris scored 26 points, and visiting Brooklyn made enough plays down the stretch to earn the victory and eliminate Los Angeles from postseason contention. The Nets followed up their historic comeback win in Sacramento and improved to 2-3 on a season-high, seven-game road trip that continues Monday in Portland. D'Angelo Russell had 21 points and 13 rebounds for Brooklyn. JaVale McGee led Los Angeles with career highs of 33 points and 20 rebounds. The Lakers lost their fifth straight, dropped to 2-12 in their last 14 games and will miss the playoffs for the sixth straight season. The loss officially ensured that LeBron James will miss the postseason for the first time since his second season with the Cleveland Cavaliers in 2004-05. James had 25 points, 14 assists and nine rebounds. Russell Westbrook had his 28th triple-double of the season as he scored 18 points, grabbed 12 rebounds and added 13 assists, and visiting Oklahoma City came back to defeat Toronto and end a four-game losing streak. Paul George added 28 points, and Dennis Schroder had 26 points for the Thunder, who lost to the Raptors in overtime on Wednesday and overcame a 13-point deficit on Friday. Kawhi Leonard scored 37 points for Toronto. Pascal Siakam added 25 points while Danny Green had 19 points. Nikola Jokic scored 21 points and pulled down 17 rebounds night for surging Denver, which moved back into a tie for the top seed in the Western Conference by cruising past host New York. With their sixth straight win, the Nuggets (49-22) tied the idle Golden State Warriors for the best record in the West. Denver has never earned the top seed in the West and has yet to make an appearance in the NBA Finals. Jamal Murray scored 18 points for the Nuggets, who also received 14 points from Gary Harris . Giannis Antetokounmpo posted 27 points, eight rebounds and seven assists to lead host Milwaukee over Miami. The Bucks' Khris Middleton contributed 18 points, a game-high 10 assists and eight rebounds. The Heat, who were led by Hassan Whiteside's 14 points, nine rebounds and a game-high three blocks, had closed their deficit to 63-58 early in the third quarter before falling apart. Their three-game winning streak ended. Danilo Gallinari scored 27 points, and Los Angeles hung on to beat host Cleveland. Shai Gilgeous-Alexander scored 16 points, adding five assists and two steals as the Clippers earned their ninth win in 10 games. Lou Williams scored 15 and had six assists off the bench for Los Angeles. Montrezl Harrell scored 14 and had a crucial offensive board late in the game to stave off the Cavaliers. Kevin Love led Cleveland with 22 points and had eight rebounds. The Cavaliers had their four-game home winning streak snapped. Evan Fournier gave Orlando its first lead of the game with 4:05 to go in overtime, then gave the Magic the upper hand for good with another hoop with 1:14 remaining, giving the Eastern Conference postseason hopefuls a much needed victory over visiting Memphis. The come-from-behind win allowed the Magic to stay within arm's length of the seventh and eighth playoff positions in the East, spots currently held by Brooklyn and Miami. Fournier finished with 27 points, eight rebounds and six assists while teammate Terrence Ross led all scorers with 31 points. Memphis lost despite a 23-point, 24-rebound performance by Jonas Valanciunas.